Vincent King, Head of Health, Safety and Environment at Brunel University played host to a delegation from the State Administration of Work Safety (SAWS), P.R. China. 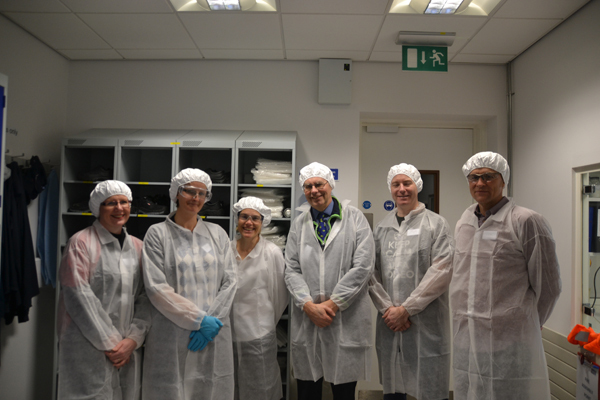 The delegation toured the United Kingdom as part of their research programme in'Setting up Work Safety Statistical Systems and the Statistical Approach'. USHA Executive Board Member Vincent was selected to represent the sector to outline how safety related benchmarking was introduced and its positive influence on safety performance in the sector to assist the delegation in their research. He says "one way of improving performances is by sharing knowledge and information on measures that work. This is why it gave me great pleasure to demonstrate the benefits gained from the USHA's work and how this eventually may contribute to people working and studying more safely in various places around the PR China. The visit also provided a wonderful opportunity to showcase Brunel and its campus to the delegation”. In 2015 the standouts have got to be the new Leadership & Management Guidance and the revised HASMAP auditing tool. The feedback from the Guidance launch in Manchester, the audience profile and the endorsements secured reflect the high esteem with which both pieces of work are held. The efforts of Monica Kanwar (Herts), Scott Trim (Coventry) and all the members of each Group have resulted in work of real significance to the sector, and of which every USHA member should be proud. 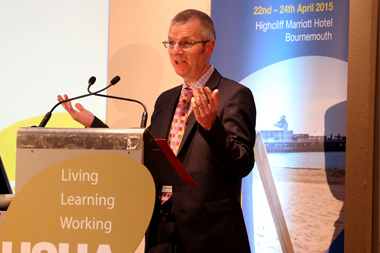 The Guidance and HASMAP will certainly be integral to both USHA and the sector moving forward over the next 12 months and beyond. Special mentions must also go to Stewart Crowe ( Liverpool) , John Crust ( Essex) and Rachel Valentine ( Manchester) as they continue to lead the Estates, Fire and Competency, Development and Training Groups. All continue to go from strength to strength, reflected now in how they're seeking regular opportunities to work collaboratively amongst one another and with other sector associations. They are also now active members of national bodies that influence and shape government policies and strategies. The groups certainly have exciting times ahead. The Belfast conference. The theme fits in perfectly with the new challenges we're facing and the programme captures these excellently. As ever, I'm sure it will be a success. What would enhance the event further is if you get chance to take up the fantastic early bird offer and extend the opportunity to team members who wouldn't normally attend. USHA holds its strategy and planning day in June to shape how the association moves forward over the next three to five years. The success of the day and, most importantly, the outcomes from it require the membership's contributions. Please do look to your local representatives (or Group Chairs if you have a specialist interest) in the months leading up to the day, in order to feed into the new strategy. USHA being centric to, and a key player in, developing the sector's Health and Safety Strategy for 2016 to 2020. Whilst we have always input to the UCEA strategy in the past, we have been asked to take a more prominent lead role for the first time. I'm sure many of our members will look to the strategy to shape their own organisational strategies. It also provides opportunity to secure influence across the many associations and bodies that support the sector and achieve the overarching common goals – securing the health, safety and wellbeing of its community and enable individual institutions and the sector to continue to evolve and thrive. Under the Leadership Foundation for Higher Education, the research of Dr. Sara Guediri into health and safety leadership amongst principal investigators and as part of responsible research. USHA is actively contributing to and supporting this project. Its outputs I'm sure will offer us valuable learning opportunities to take not only to our own research communities but also inform our institutions' approaches to health and safety leadership. I want to close by giving massive thanks to: my colleagues on the executive; Lynda, Gail and Lesley who continue to be the backbone as at USHA Central; and, most importantly, you the membership. You are USHA's lifeblood – vital, indispensible and essential for life. Please, please, please do have a wonderful Christmas and here's wishing you a successful New Year. I do really hope to see you at one of the many events and have opportunity to contribute to the areas of work in the year ahead. New sentencing guidelines for H&S offences have just been published looks like it just for England and wales does anybody now the position in scotland. Napier University Edinburgh has carried out a survey of members to look at Occupational Health provisions in our Institutions. The meeting is on Wednesday 23rd September 2015 in Cambridge, and the agenda is attached below. In July 2015 Edinburgh Napier University carried out a survey to determine the number of Universities who employ dedicated fire officers. The UKNSG ,with The Royal Society of Chemistry and the Health and Safety Executive, is putting on a day conference, “Working safely with Nanomaterials”. It’s taking place at Burlington House, London on Wednesday 9th September. The event will see the launch of the revised guidance ‘Working Safely with Nanomaterials’ and leading experts and practitioners in nanosafety will provide an update on most recent knowledge, methods and techniques for working safely with nanomaterials in laboratories including. This event is supported by USHA as an active partner of the Group. Costs are : £120 per head and £100 for RSC members. We welcome the following new appointments. Nisa Carey formerly of the University of Greenwich who is now working for British Transport Police. Suzanne Thompson Head of Safety Health and Wellbeing at Strathclyde has taken up a post outside of the sector closer to home in Argyll. The USHA Midlands Group recently held its meeting at DEB (Skincare) based in Denby in Derbyshire. The DEB Group has for established skin care regimes for all types of workplace and public environments, spanning industrial, commercial, healthcare and food sectors. It has recently donated more than 18,000 bottles of Deb InstantFoam hand sanitizer to the World Health Organization (WHO) to assist efforts in combatting the spread of Ebola virus in West African countries. 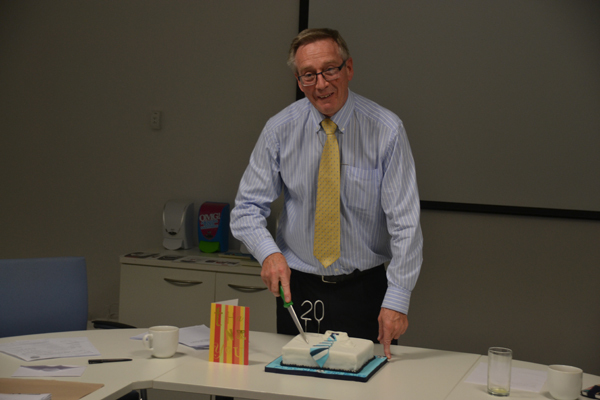 It was also Bill Leslie’s penultimate day before retirement from Coventry so they made him a cake! The NWWHSG, the Group, is a part of Safety Groups UK. The Group is a self-help, non-profit organisation, consisting of members from a wide range of employers and organisations from across North Wales with a mission to 'Work in partnership to ensure workplaces are healthy and safe for all'. Bangor University acts as the secretariat for the Group. The Group aims to provide a welcome to both members and also non-members by offering people an open, friendly and informal atmosphere to discuss health & safety. Membership costs are set per organization regardless of how many people they wish to send or invite to attend. This open invitation allows individuals and organisations to attend and experience the activities of the Group before joining and also allows organisations to send as many people and bring guests as they wish. The backbone of the Group’s activities is the annual programme of monthly activities like talks, workshops or conferences, usually held on the second Wednesday afternoon of the month. These activities provide participants with networking opportunities and a firm and stable platform to learn and exchange information. They also are a valuable tool to obtain evidence for continuing professional development. In addition the Group has traditionally had very strong links with the HSE and aims to support their strategy deliver by providing information and updates, supporting campaigns and promotions as well as encouraging contributions to consultations. The overall programme for the year is designed with a wide range of interesting topics, events and activities to appeal to a diverse audience. All speakers are recognized experts in their own field. Talks this year have included Coaching Skills for Safety Practitioners, update on CSCS cards and Tower Scaffolding. In addition we held a one day joint dual conference and exhibition on Moving and Handling and Back Care for the Construction and Care sectors. This event was arranged by Gwynedd Council, Bangor University, North West and North Wales Back Exchange Forum and Working Well Together Wales. Support was provided by the Local Councils of Conwy Borough, Denbighshire County and Flintshire County. Future talks will include Loan Worker Safety, Asbestos Roadshow, Crime and Punishment, Air Monitoring and a one day Construction Safety and Health Awareness Day. To promote activities the Group has its own bilingual website, which covers the general information on the Group and Membership together with the details of talks, activities and presentations as permitted by the speakers. The website also links to other organisations and websites of interest. The Group maintains its own contact database, open to members and non- members. Emails are sent regularly to provide program details and updates including other Group activities, links to ongoing consultations and general information that is considered to be of interest. The group has established three sub-groups driving change for safety excellence in the management of CDM and Asbestos across the HE Sector, notwithstanding the methods and techniques in which Universities provide assurance to their stakeholders around statutory compliance. 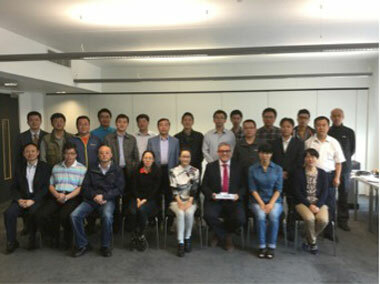 The USHA Estates specialist group is in the process of developing a fourth working group focusing on environmental and waste management in construction, led by Ian Muir from the University of Liverpool who has recently achieved a Master degree in in environmental and waste management in construction. • A comprehensive PowerPoint presentation covering CDM 2015, aimed at Estates technical staff. Building on the work of Rik and his group, we have made initial steps to start to collaborative with the National Construction Clients Groups working with the UK’s large organisation to drive change in health and safety management of construction and maintenance. The compliance group led by Stephen Hughes, Imperial College London is developing an understanding of how university’s manage their legal duties and focusing best practice methods of recording information to ensure recommendations are logged and actioned to enable a transparent audit trail of the cycle of the process. The Asbestos Group led by Richard Walker of the University of York is planning to hold an asbestos awareness roadshow in collaboration with the AUE raising awareness of asbestos removal projects. I would like to take this opportunity welcome Richard Walker to the Estates Group Committee and to thank the members of the Committee and Sub-Groups and their hard work as we strive forward to influence safety performance across the HE Sector. As part of their final assessment, students were exhibiting work in a degree show. The room had a high fire loading including timber panelling, furniture, and books. A working projector was located in the display area with expanded foam panels positioned behind. The fire was caused when flammable gas used as a propellant within a canister of expanding polyurethane foam was discharged in close proximity to the projector. Flammable gases used as a propellant in the expanding foam canister were drawn into the projector and ignited, most probably by energised electrical components. A sprinkler system was being installed however it was not operational. Attempts were made to extinguish the fire with a carbon dioxide fire extinguisher however; this has little effect due to rapid fire growth involving the foam covered walls. The foam then became totally involved in fire producing further flammable gases and thick black carbon rich smoke. The alarm was raised and staff ensured all persons in the immediate area evacuated. The construction, layout, and high fire loading meant the room contents became totally involved in fire. 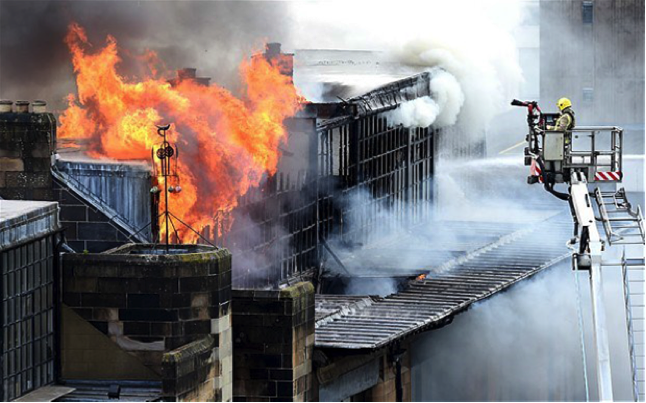 A major contributory factor for the fire spreading throughout the building was the number of timber lined voids and obsolete ventilation ducts running both vertically and horizontally throughout the building. Hot gases and smoke would have travelled unchecked up the voids vertically and horizontally affecting other floors of the building. I recall my first Yorkshire group meeting in November 1997, literally a couple of weeks after starting at Huddersfield and being a fledgeling to the sector. What struck me straight away was the camaraderie amongst all those there. Something has stuck with me ever since – without hesitation Tom Fleming and John Mellor taking me to one side, welcoming me to the family and all this brings. Over 17 years later the family remains so strong. On behalf of the Executive I’m really grateful for the overwhelming positive support for the proposed move to company limited by guarantee. I can only reinforce what was conveyed at the AGM and the supporting pieces of work before – the move will not affect the USHA family. The Executive will now focus on drawing up agreed articles of association and terms of reference for the new company. These will then be legally verified before circulation to the membership for approval. The intention is for that circulation to be in mid-June. I’d like to congratulate Selina, Robin and Eleanor on their election to the Executive and welcome them ‘aboard’. New people joining the Executive arises from others departing. I therefore wish to convey many thanks to Cathy, Monica and Liz for their dedication whilst serving on the Executive. I was really pleased with how well the conference proceeded. It was great to see both familiar and new faces. I received many positive comments and colleagues on the Executive reported similar. This is very encouraging given the theme specifically targeted ‘wellbeing’, a shift from the more traditional safety focused approach to our main conference. The collaborations in bringing the conference programme together offers us the springboard for future opportunities. I can only repeat the many thanks to Karen, Emma and all at Bournemouth, as well as Lynda and the events team. I’ll take the credit for the weather! Looking ahead I’m really excited about the impending leadership guidance. It promises to represent a significant directional change from the existing code, striving to enable individual institutions to secure leadership and influence in health and safety across all levels of the organisation, not just as the most senior levels. The revitalisation of HASMAP to coincide with the new guidance is perfectly timed. I know Monica and Scott were grateful for the many positive comments you gave during the specific spot on the conference programme. 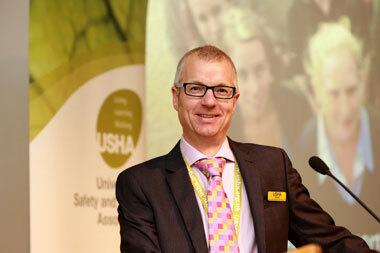 In the short-term there are many challenges ahead in moving USHA forward to a secure position. As was emphasised during the AGM and in the papers that proceeded, transparency with the membership is key. You are the association’s lifeblood. The Executive and I fully respect this. The 2015 Green Gown Awards have been launched – please note entries close on the 12th June.